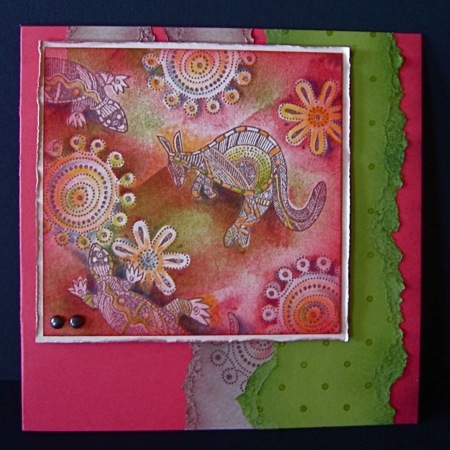 Sale-A-Bration Cards made from the Polka Dot Punches Stamp Set. Sale-A-Bration time at Stampin' Up! is so much fun, as everyone has the chance to earn FREE STAMP SETS. But you have to hurry as this fantastic promotion finishes on February 28th. The four stamp sets are only available during January and February, so take a peek at the SAB Catalogue and see which one you will put first on your list. 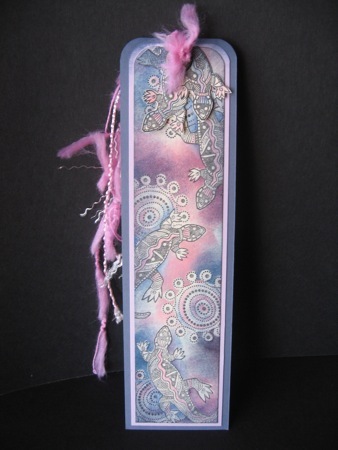 I wrote a little about the technique I've used on these cards in a previous post relating to Sale-A-Bration, and added one example, but now I have a few more to show the variety of cards and a book mark that can be made in a few hours. I printed directly onto some SU paper from our first Australian Idea Book and Catalogue, then I added some "tracks" by drawing freehand with a coordinating coloured Stampin' Write Marker. You really can find colours like this in our desert, especially after a big rain. Using the same colour palette I decided to try a different effect by using partial images of both the animals and the "water holes". It ended up becoming a book mark! I added a bit of interest by creating a flap of two goannas looking down at the rest of the scene. They form a little tab over the marked page. 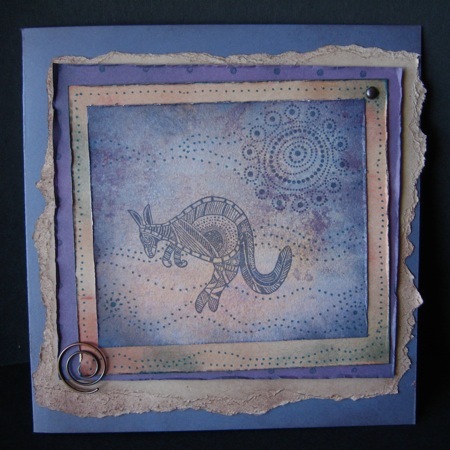 In this card I've tried different effects with sponging - hard edges as well as the usual soft edges obtained by sponging. The shadows are enhanced with a blender pen and ink from classic ink pads. The "water holes" and "camp fires" are created with the Polka Dot Punches- my favourite of all the free SAB sets. 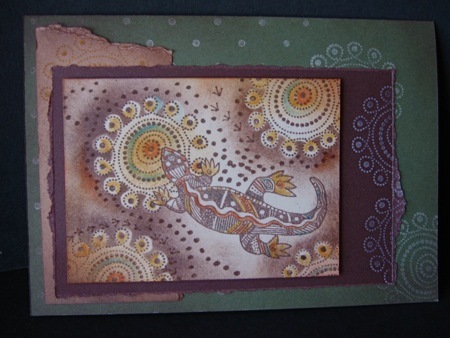 The final card is perhaps the most representative of the earthy colours one would expect to find in Aboriginal art. All images © Stampin' Up! ® 2006 - 2009. Art work by Ann Craig.